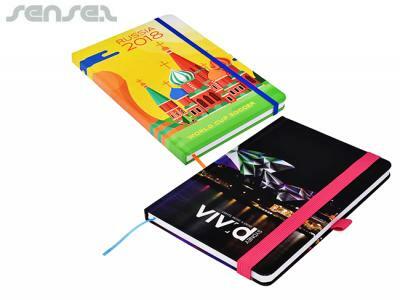 Other innovative corporate gift ideas that could be suitable to create brand awareness include these cheap promotional Venice PU Notebooks A5, quirky advertising gifts such as these Endeavour Soft Faux Leather Notebooks A5 or how about using one of our more bespoke custom made products such as these great quality Cirro PU A5 Notebooks? Personalize your illuminate custom full colour notebooks a5 or custom design custom notebooks for your marketing campaign. How can these unique promotional illuminate custom full colour notebooks a5 or our personalized custom notebooks fit in with your marketing strategy and help you maximize your brand exposure? We can have your logo branded on these corporate Illuminate Custom Full Colour Notebooks A5 in Full Colour Digital Print. A setup fee of US$112.00 will apply to make the film. The delivery time is 5 - 6 weeks from time of your order.